Wow, I can't believe 2011 is almost over. It was such a special year for me. 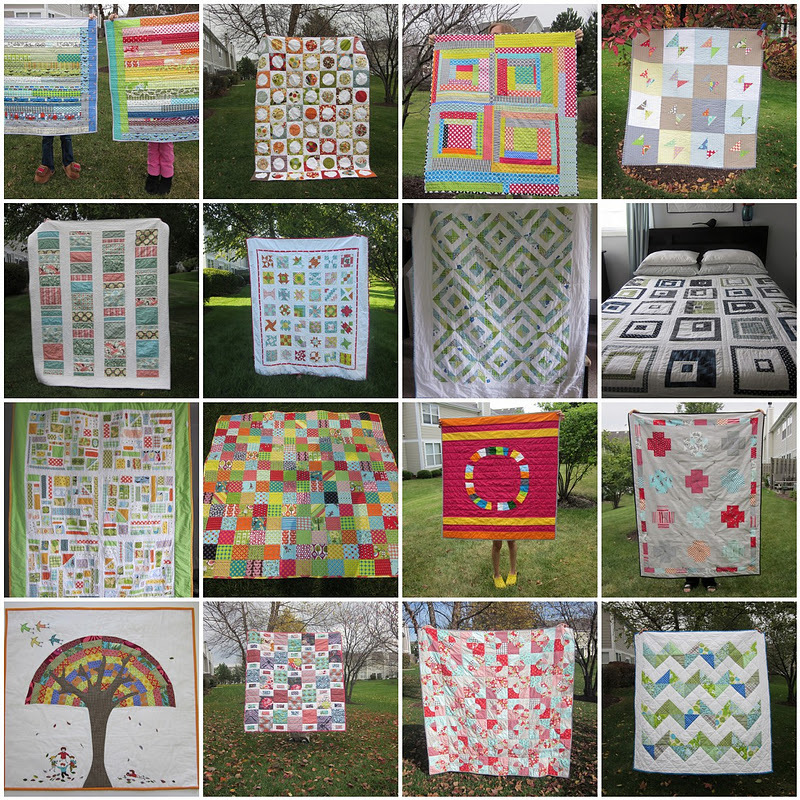 I made my first quilt in December 2010 and that one quilt led to a whole year of absolutely obsessive sewing and quilting. And when I say obsessive, I mean really, really OBSESSIVE, like sewing almost every single day obsessive. I made a ton of quilts, every single bed in our house is covered with a quilt, plus we have some extras for snuggling while watching TV. Oh, it was so much fun. Altogether, I made about 22!!! quilts. These are my favorites. 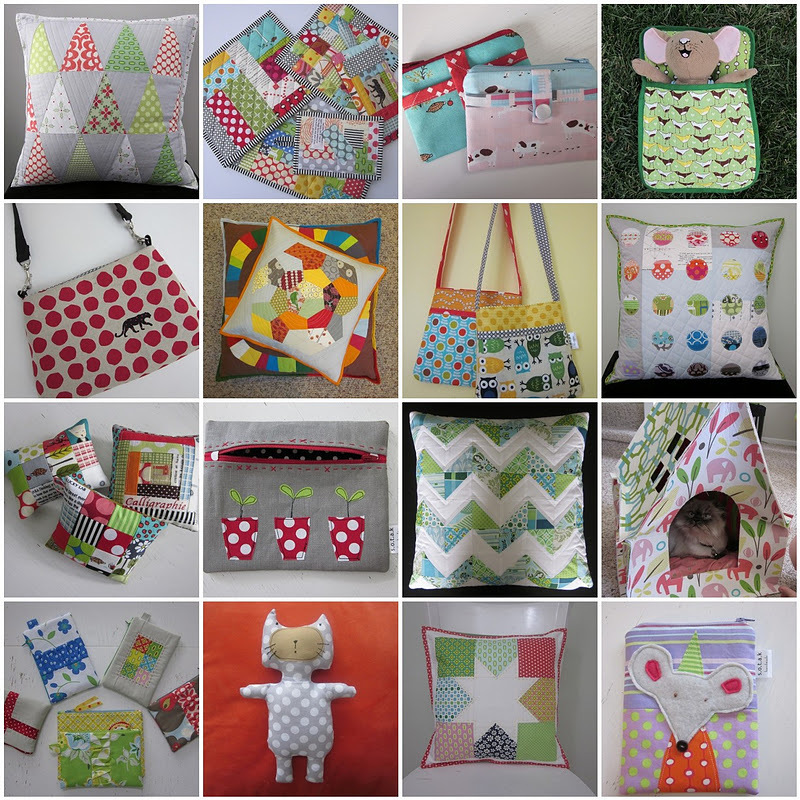 I also made pillows, and bags, and pouches, and many other small projects. I took part in a few swaps and joined Do. good Stitches Charity quilting bee. And even though I enjoyed every. single. moment. of my sewing obsession, it got completely out of control. So, for the year 2012 my plan is to keep sewing, but also bring some balance into my life. I'd like my sewing to become a manageable hobby along with reading, some exercise, and spending more time having fun with my husband and kids. I still want to keep making quilts, just less of them. Thank you all for coming along on this wonderful journey. Your encouragement is so invaluable to me, I love reading all your comments, Thank you, Thank you!!!! Here's to a fabulous, crafty (and hopefully more balanced) 2012!!! As promised, I'm back with another project inspired by Scrap Republic - this time a strip quilt named Beeline. I followed directions given in the book pretty closely since I wanted to achieve the same rainbow effect as the pictured quilt. I did, however, change the dimensions once again. I made it a little bigger and my finished quilt measures 34 x 37 inches. I made a quilt backing using 3 strip of wonderfully soft flannel, did a straight line quilting along each strip, and bound it using black and white Michael Miller fabric from his Little Mikes collection. Here it is, all finished. I thought it would make a great gift for my very pregnant neighbor. Just one "tiny" glitch, she's expecting twins (a boy and a girl) so one quilt, of course, would not cut it. That's where my second Beeline quilt comes in. I decided to make another quilt using the same dimensions and pattern, just more boyish fabrics. I also limited my color palette to mostly white, green, and blue, with some touches of gray thrown in. This was the result. I did the backing the same way I did it for my first quilt and joined 3 strips of flannel together, did the same straight line quilting and finished the quilt using the same fabric for binding. I love how they both turned out. Both of these quilts were a lot of fun to make and came together rather quickly. And I love how they are similar, but not the same, just like the twins, right? I've been oh, so in love with all the quilts featured in the book Scrap Republic by Emily Cier for a while. I kept looking through the book and planning and plotting which quilt to make first. I finally started off by organizing my scraps, not the most fun activity, but it had to be done. And, after about 3 very long and tedious hours, I was happy to see all my smaller scraps nicely organized in plastic bags. Then came the hard decision, which quilt to make. I really like them all. And, since I'm actually toying with an idea of making ALL the projects in this book, I decided to start at the beginning. The name of the quilt is Freckles (how cute is that, right?). The quilt in the book measures 30 x 30 inches, I had no idea what to do with a quilt that size. It seemed too small for a baby quilt (plus, no more babies in this household and I really wanted to keep it for myself), so I cut all the measurements by 1/3 and made a 20 x 20 inch pillow cover. and used a zig zag stitch on my sewing machine to stitch them in place. After that, all I needed to do was to make a pillow back, insert a zipper, and finish the pillow cover off by attaching the binding. And, yay!!!! my first project from my very favorite book was finished. I LOVE it sooo very much, it makes me smile every time I look at it. And, to show you how obsessive I sometimes get with sewing, I'll show you a quilt top I managed to make yesterday while my children were happily entertained playing with their Christmas presents. My inspiration, of course, came from Scrap Republic. What can I say? I really do love that book. How about you? Do you have a book you keep turning to for inspiration? Have a wonderful and creative day, Svetlana. May your Christmas be full of love, fun, and laughter. Hope it's a wonderful and magical time for all of you. A few days ago I finished these 3 totes. I love how they turned out and was very tempted to keep at least one of them for myself. Then the reason won over my feelings and they are going to be given to my children's wonderful teachers as Christmas gifts. I made up my own pattern, and actually wrote down all the dimensions, so I'm sure you'll see more of these on my blog soon. and the fact that I used webbing for the handles made these totes a breeze to make. These tree beauties conclude my Christmas gifts sewing. I had a lot more gifts on my list but I decided for a change of plans and move on to other projects. Scrap Republic is so calling my name. So, I'm off to immerse myself in scrap sorting. I've wanted to make a garland (I used to call it a bunting but my daughter says it makes me look like I'm 100 years old and very old fashioned) for a very, very long time, long before Christmas rolled around. I browsed Flickr, read through many tutorials, and I've probably spent way too much time thinking and plotting such a small project without accomplishing anything. Until this Sunday, that is. I sat down and made this garland. I love using non-Christmasy fabric for Christmas decorations, so I used some of my very precious fabrics by Amy Butler and Heather Bailey. Once the garland was finished and hung I was in no mood to put all that gorgeous fabric away. I pulled some bigger scraps of Christmasy fabric that went well with my garland fabric and Kona Ash (probably my most favorite solid color at the moment). And I cut, and sewed, and ironed, and quilted, and another pillow was finished. Here's the detail of my quilting. And here they are both together, my garland and quilted pillow, making our living room more festive. How is your Christmas sewing going? I still have a few more small presents to make, mostly pouches. I'm hoping to finish them soon because my mind is already racing towards a new scrappy quilt. 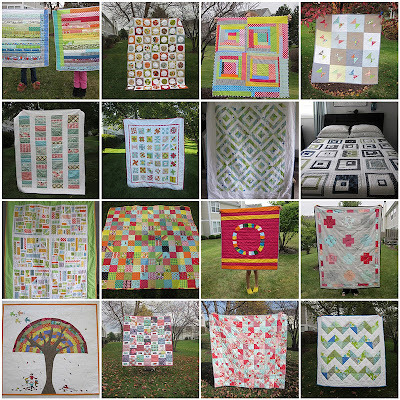 Let's just say for now that I flip through Scrap Republic's pages and drool over all the featured quilts on a regular basis. What a week this has been. Sew Mama Sew giveaway was so much fun. I loved reading all your comments. A great, big, warm Thank you!! to all who participated, all 629 of you. Rachel and Amy, CONGRATULATIONS!!! I sent you both emails, let me know if you did not receive them. As promised, I'm back with more wonky stars (actually just one, because I completely forgot to take pictures of a wonky star mug rug before I gifted it). Once again, I turned to my absolutely favorite combination of gray and white with some green and blue sprinkled in. I used mostly fabric by Sweetwater from their Hometown collection, and some of my very favorite scraps by Anna Maria Horner, Amy Butler, and Heather Bailey. I did simple hand- quilting around the star and straight line quilting along the gray and white borders. And, just so you can really see how obsessed I am with gray, let me show you my newest table runner. It took me forever to finally decide on this runner. You might remember the one I made a while ago, I chose all the wrong fabric and it did not turn out how I imagined it at all. I like this new runner a lot better and I think it looks just right in our kitchen. It's quite simple - a long strip of linen framed with strips of patchwork in blue, green, white, and black. It was inspired by this throw. Linking up to Amanda Jean's Finish It Up Friday! Welcome to my Sew Mama Sew giveaway. I'm so glad you're here. I'm planning to have two winners and here's what I'm giving away. One random person will win a wonderful assortment of 36 different designer Christmas charms and Bend-the-rules Sewing book by Amy Karol - the essential guide to a whole new way to sew. Second random person will win a Ready, Set, Snow Christmas charm pack by Moda and Fa la la la Felt book by Amanda Carestio - 45 handmade holiday decorations. The giveaway will close on Friday night (Dec.16th), I will randomly choose 2 winners (please make sure I have your email to contact you), and will mail your winnings on Monday, December 19th. *Leave me a comment on this post. *You can also have a bonus entry, just let me know that you are my follower, or become one and let me know. The giveaway is open to domestic as well as international entries. Thanks for stopping by. Have a wonderful rest of the day, Svetlana. 1 cup defrosted raspberries - I buy frozen raspberries with no sugar added. They need a few hours in the refrigerator to defrost before you can use them. I put them in a plastic container and this is what they look like after a few hours - nice, soft, juicy. 1 mixing cup, I have a special cup for making shakes but any container with a really tight fitting lid will do. Let's start, shall we? Pour all 3 ingredients in the mixing cup. As you can probably guess this post is about pouches, and lots of them. Ok, so I kind of went on a pouch making spree and it felt like Santa's workshop has moved into my living room. Want to see? There were so many tutorials, patterns, and different fabrics I used for my pouches that I'm having a really hard time coming up with words to go with all the pictures. So, for now let me just show you my final products and I'll try to get back to them later and give more details. I also found a wonderful tutorial showing how to make a boxed pouch. What I really liked about it is that it shows the way to have all the edges finished, no raw seams, no bias tape. Sorry, it's not easy to photograph a boxy pouch. This picture really does not do it justice, it looks way better in real life. Would you be surprised if I told you I'm burnt out? I was planning on making a lot more pouches and bags (I had this self-imposed idea to make handmade presents for all my children's teachers, friends, etc.). And suddenly I realized that instead of the usual enjoyment while sewing it turned into something I had to do. So, I decided to buy the rest of the presents, no more pouches for me right now, thank you! and only work on something I will enjoy. Probably a Christmas table runner for our dining table. I'll let you know soon. How are you doing this Christmas season? I really, really love polka dots. Add some stripes and a few solids in happy, bright colors, QAYG quilting method, some improvisation, batting, and the softest minky fabric and this is my result. This is my first truly improvisational quilt. I really like how it turned out and hope to be able to do more improv quilting in the future. I decided to go with QAYG method, it proved to be very trying and stretching my patience. I'm not used to taking that long just to produce one block. And, quilting block pieces in straight lines about 1/2 inch apart does take a while. I went with soft minky fabric for the back. I think it complements the quilt top very nicely and makes this baby quilt gorgeously soft and cuddly. Finished size is 33.5" x 37.5". I put this quilt up for sale at my Etsy store.